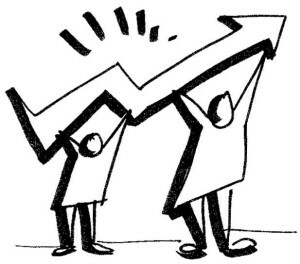 Working visually in Process Work with groups and individuals is growing rapidly. Having been a practitioner for over 20 years (a teacher for 15 of those years) I often encounter people who are really attracted to the visual way of working but are worried they can’t do it because they “aren’t artists”. It’s a shame when people allow this limiting mindset to stand in the way of them using a methodology that they resonate with and one that can positively serve the populations they work with. And totally unnecessary too, as I’m here to tell you that you DO NOT need to be an artist to do effective visual process work. Here’s are 5 ways that non-artists can work visually too. If you are attracted to the visual way of working my guidance is to trust your instincts and jump in via a good basic training. 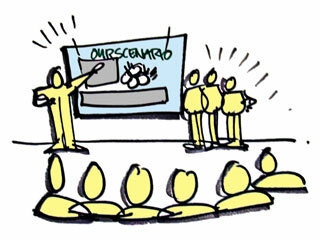 A good trainer will demystify the visual methodology by deconstructing the work in a helpful way. 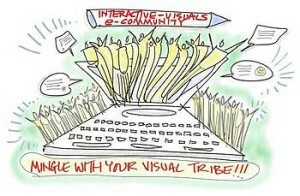 Using visual methods is actually kinesthetic for the practitioner. If you can move, you can be taught how to move you body, with marker or stylus in hand, to create the shapes, letters and icons that are used in the method. One of the most fun things for me as a long time trainer of visual skills is to show people how to properly move their bodies to make decent lines and circles. And how to put those lines and circles together to form other shapes, letters and icons. All combined with the extracted knowledge nuggets of what is being discussed. This approach is liberating and even healing for those who carry art trauma from their past. 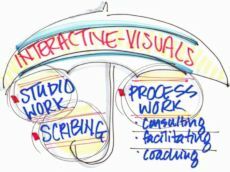 In visual process work there are four main ways of working visually: Studio Work, Graphic Recording, Graphic Facilitation and Graphic Coaching/Counseling. The first two are more ‘push’ oriented where the latter two are more ‘pull’ oriented. Push applications tend to have more elaborate illustrations whereas pull applications have less. If you are a Process Professional who works with groups and/or individuals already then a nice way to begin to add the power of working visually to your practice is via pull applications. These applications often use pre-prepared templates (either purchased or hand made) where most of the drawing is pre-done, which frees you to focus on content extraction. *** For fuller info on the 4 main way of working, including push and pull distinctions, see article/video here. In my classes I am forever reminding that ‘the only way out is through’. If you want to get functional at something, then you need to practice, practice, and practice (Malcolm Gladwell’s Outliers book always comes to mind). Nobody starts out good, even fantastic artists (as they often have to let go of some of the proper technique they have been taught in order to keep up with the pace of facilitated processes). Studio Work is an excellent way to practice and hone your new budding visual skills. In most process work with groups and/or individuals there is some content that lends itself well to creating a studio piece around it. Some sort of prepared visual artifact that pushes helpful info to participants. Maybe it’s a chart that explains the agenda and proposed outcomes of the event. Or an explanation chart of a theory or model being used. Or some instructions for an activity. In creating these artifacts, in the quiet and solitude of your studio, you can take your time and also use helpful methods like projection, transfers, stencils etc. So they look great when they are used in the live setting. The more Studio Work you do the more the techniques get embedded in your body and psyche. So you can whip them out in live settings much easier over time. *** See these articles for more on this subject: Process, Practice and Positioning, Yes Virgina There is a Santa Claus, You!, and Create Your Signature Style. I already mentioned how long I’ve been in the visual process field and it may surprise some to learn that I don’t self identify as an artist, at least in this work. To me this interactive-visuals work is not about art, it’s about process first and foremost. 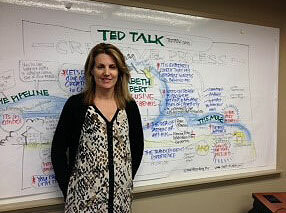 There are many methods I employ in my process work with groups and individuals to help my clients breakthrough (visual techniques being just one of them). A final thing to consider if you aren’t an artist yet you still want to work visually with your clients. 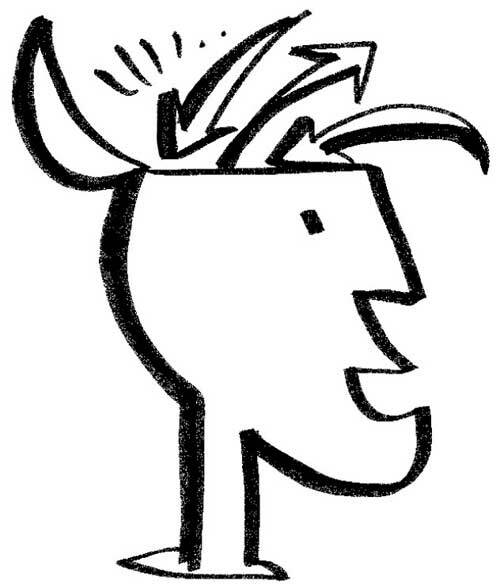 Is, when need be, you can sub-contract to artists, designers and illustrators who have more specific chops than you do. Most of my work is roll up your sleeves process work which is fast, furious and spontaneous — its visually appealing but due to time constraints its not perfect, and nor does it usually have to be. However, for those times when more perfection is required and I have neither time and/or the specific ability required, then I will sub-contract work out. Subcontracting is a win/win in my mind. I do the fast, live content extraction work that I’m great at and the person I sub-contract to gets the type of work that they like and are skilled at. And my client gets an awesome deliverable that is perfect in both content and design. Another way to up the quality of your work is to create co-teams and other ways of linking with other Visual Practitioners. Is there someone else in your organization who resonates with the way of working too? 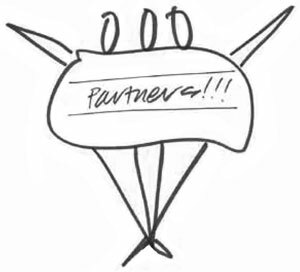 If so, collaborate together as you build your skills (trading off the scribe and facilitator roles with each other depending on the nature of the work you are doing). Or find people in your region who are already working visually or are also intrigued by it but haven’t jumped in yet. Many of my students are creating local hubs in their home geographies. These hubs foster the sharing of ideas, resources and encouragement. If a group doesn’t exist in your area then create one! FYI, I host an online Interactive-Visuals eCommunity for all grads of our visual programs including a monthly drop-in webinar for continued connection. Write admin@shift-it-coach.com for your invite. The visual way of working is growing in leaps and bounds. Hopefully I’ve reassured you that you do not need to be an artist to effectively use visual methods in your own process practice. If you are interested in developing your visual skills we have public workshops (both in-person and online), private trainings (you come to me or I come to you). Plus a new Home Study Kit available at any time — get going on your visual attraction now! Advanced mentoring also available via distance sessions.